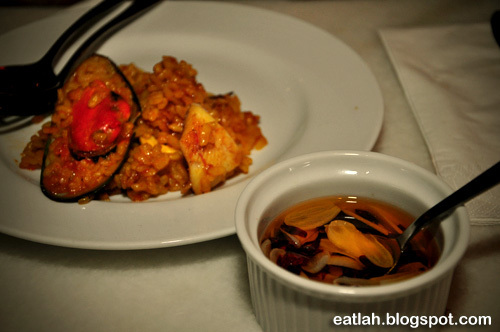 El Meson @ Bangsar, KL | where and what to eat lah? Hola! It's time for Spanish cuisine and we were brought to El Meson by a close friend of ours. 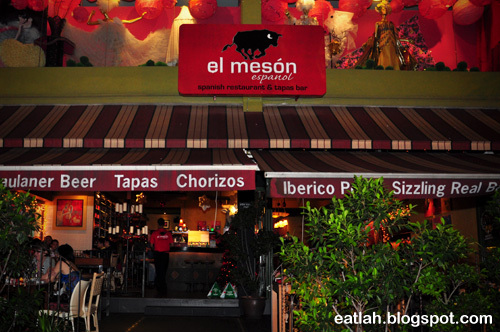 El Meson is located along the row of pubs and posh restaurants on Jalan Telawi 3 in Bangsar. The interior is rustic and warm, with a bar area and dining tables that sprawled around the restaurant and walkway. El Meson is true to its Spanish origin, from the imported ingredients used to iberico pork and even to their head chef, Fernando Martinez Tabernero - a passionate young Spaniard who hails from Valencia. 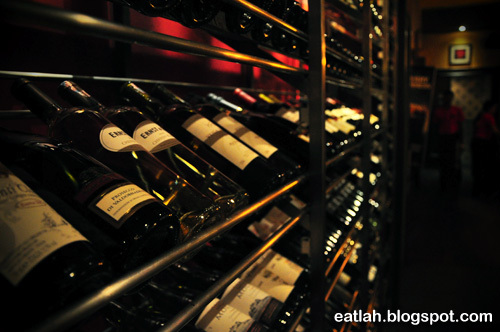 Like any other upper-class restaurants, El Meson too boasts an extensive range of fine wine and alcohol. 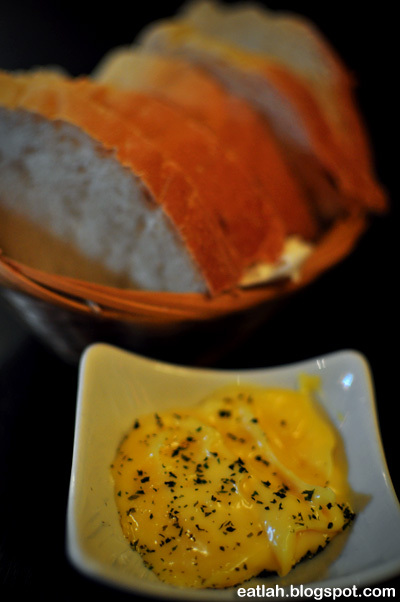 The meal started off with a complimentary fresh and warm bread basket served with rich garlic butter. You might want to save some bread to go with the tapas. 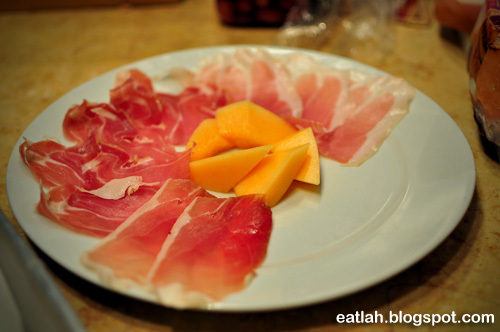 I had my first melon and ham combination in Madrid many years back. I must admit, I was a bit skeptical at first but the saltiness flavor of the ham makes an excellent contrast with the sweet and juicy melon. 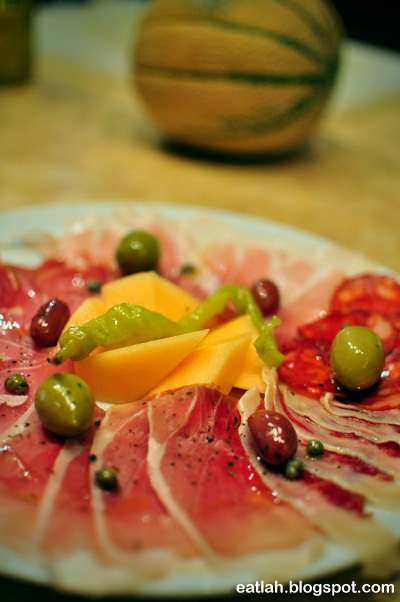 Platter of cold cuts for two (RM 54), thinly sliced layers of iberico, serrano, parma, speck, chorizo and salchichon with melon, olives and capers. 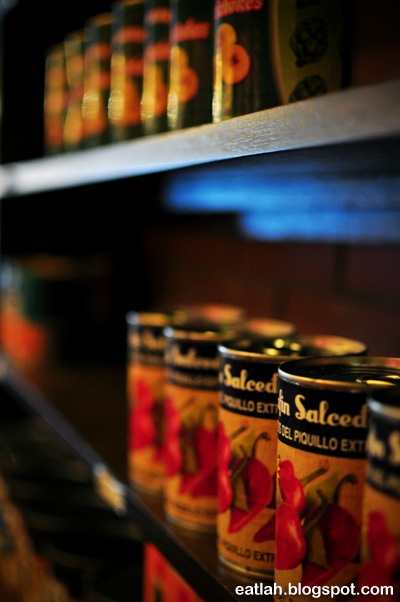 Apart from the similar saltiness, each of its own exhibits a different taste and texture characteristic. 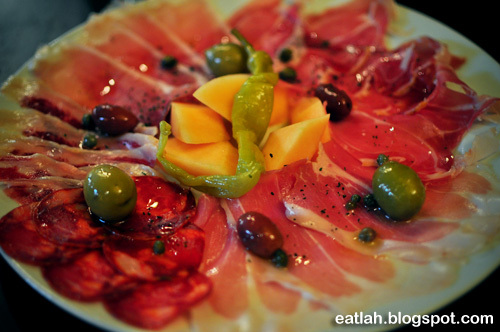 The iberico ham was a stunner with its melt-in-mouth texture and a smoky nutty undertones. So what makes these ham so special? Similar to Kobe beef in Japan, the iberico ham is made from the black Iberian pig lives primarily in the south and southwest parts of Spain. These pigs are allowed to roam in pasture and oak groves to feed naturally on grass, herbs, acorns, and roots, until the slaughtering time approaches. 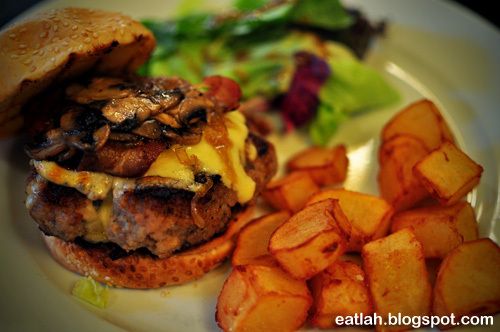 The ultimate pork burger (RM 25), topped with cheese, mushroom, bacon and caramelized onions in a sesame bap and served with potato wedges and salads. The pork patty was incredibly thick and tasty! This pork burger is undisputedly one of the top pork burgers in town. Unfortunately, it is only available for lunch! An endless list of tapas is unsurprisingly available at El Meson with an exhaustive choice of both hot or cold kind...it's all there. 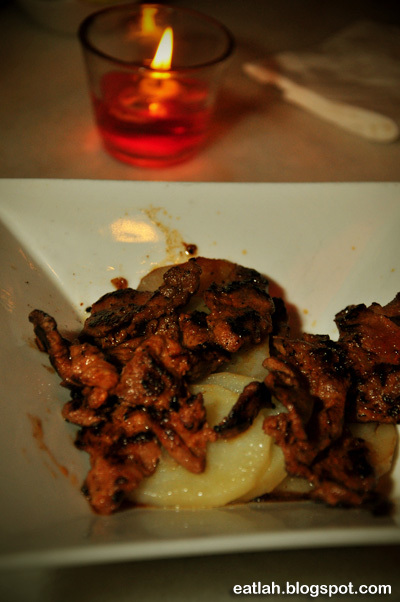 Iberico pork strips in honey and sweet paprika on potato (RM 24), it was really really delicious, tender and sweet. However, it was a little too expensive for such a small serving. Maybe it was me, not a fan for tapas style dining gimmick - which is small and expensive. 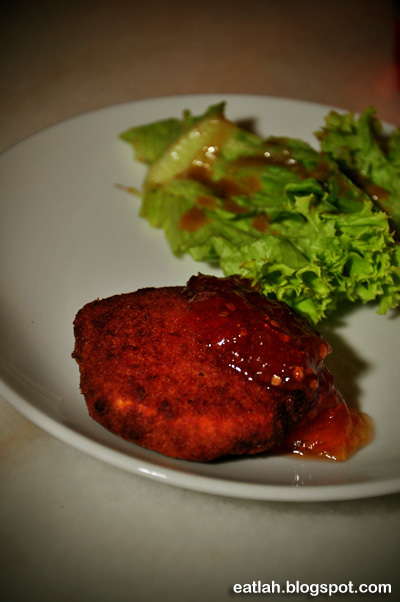 Queso frito (RM 14), deep fried goat cheese with tomato jam. It was crispy outside but soft and stringy inside with a strong robust cheesy flavor that complemented well with the sweet and tangy tomato jam. It is terrific if you enjoy strong-flavored cheese! 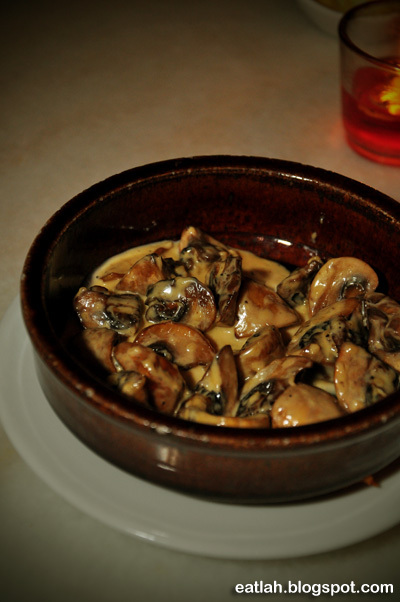 Champinones (RM 14), saute button mushrooms in garlic, wine and cream. You can't go wrong with that and the sauce went well as a dip for the bread. 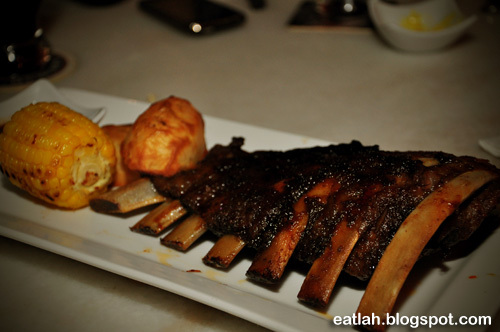 Iberico rack of ribs (RM 62), oven slow cooked and basted with slightly smoked sweet membrillo sauce. The ribs were so delicious and fall-off-the-bone tender, each bite was a little taste of pork heaven! 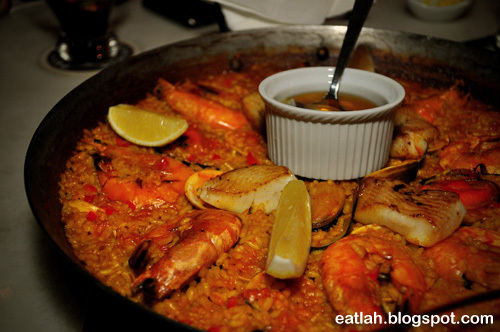 Paella marinara for four (RM 118), with mussels, squid, prawns, clams and halibut in rich seafood and chicken stock. I had my first paella cooked outdoor in Spain and ever since, I couldn't find that authentic taste. Nevertheless, this luscious dish was filled with generous seafood toppings with a tinge of aromatic saffron. For a nice touch of flavors, you might to add some olive oil with garlic and dried chili flakes. 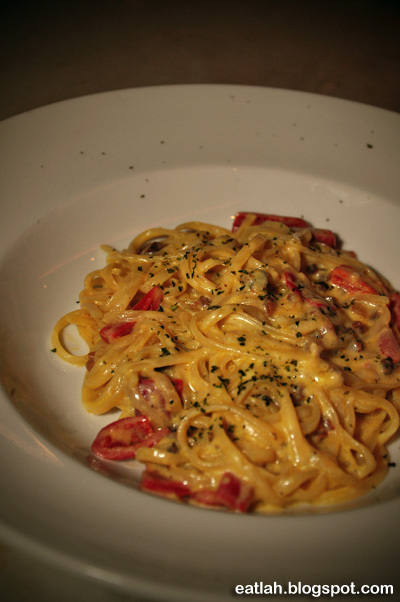 Linguine with speck and piquillos pepper in cream sauce (RM 32). It was actually pretty good and the cream sauce had the right creamy consistency too. For drinks, we had a jug of sangria (RM 78) for the six of us. 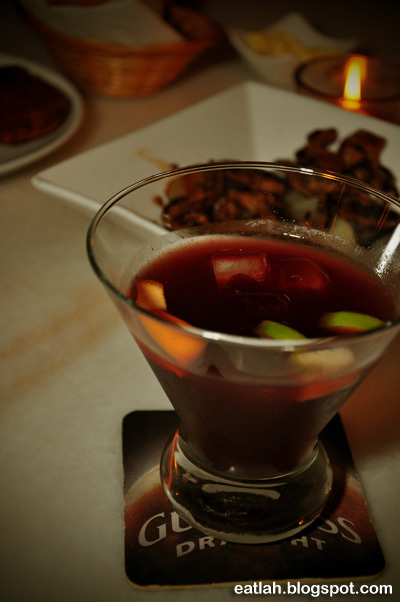 Made from refreshing blend of red wine, rum, orange liqueur, sprite and fruit pieces. 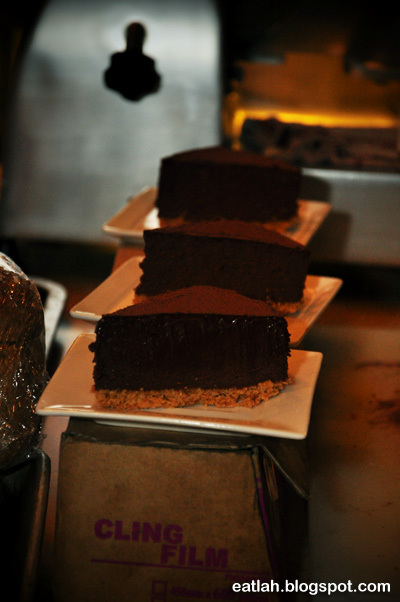 Finishing a lavish meal with these dessert masterpieces waiting for you at the end of the meal. 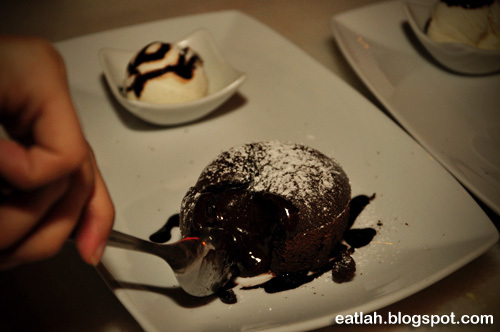 Their signature dessert, the ultimate molten lava chocolate with vanilla ice cream (RM 18). These warm, round individual chocolate molten lava cake oozed out rich molten chocolate that strikes a perfect balance with the sweet and cold vanilla ice cream. It was heaven to the taste bud and absolutely to die for! Verdict: It was an upscale dining experience with an expensive price tag but overall, food is good. The service was a little slow but good food is worth waiting for. If you're looking for an excellent contextual advertising company, I suggest that you check out ExoClick.